At the beginning of this section, I showed you some automatically generated trend lines on a chart, and also cautioned you about relying too much on the charting software without considering carefully what the input is, in this case the number of days over which the trend is calculated. It is a useful exercise to print out a few charts and try drawing trend-lines on them. Sometimes you will get a straight line that connects several points, and sometimes you will not be able to find any satisfactory line. 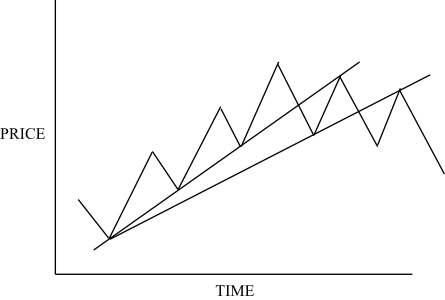 To draw an up-trend line, you need to connect successive low points in an up-trend. The definition of a trend says that an up-trend has successively higher low points, and you’re trying to draw a straight line which connects these. You can start drawing a trend line as soon as you have two low points to connect, although this must be considered only tentative at this early stage in a trend. Many technical analysts won’t even consider it a trend line until there is a third point to be connected. Of course, this third point may not line up to allow you to draw a straight line between them, but you will find that it quite often does. Later on we’ll talk about the slope of the trend line, as there are some theories about how this changes over time. Looking back at the candlestick chart we introduced when we first talked about charts, you can see that a trend line can be drawn connecting several points. Successively higher lows are connected to show the trend, and you can see clearly where the trend is broken, tested first with the long black candle and then completely discarded with the next small white candle – rather like the support and resistance lines being tested and eventually failing, but at an angle. What about the down-trend? You can draw this in a very similar way, but remember that the line connects successively lower high points, so the line is drawn over the top of the price chart. The same idea applies, that you need to have at least three points for it to be a valid trend. I’ve mentioned the similarity to support and resistance, and you can also use the same methods to determine the strength of the trend-line. For instance, you can look at how well it has lasted over time, how recently it has been tested and how many times, and the answers to this will give you a feeling for whether it is likely to hold up or to fail under pressure. Any time the line has been strongly established, and survived, despite repeated tests, the eventual breaking of the line is considered much more significant. Once you have found a trend line that seems to be holding up, you can use the ideas in the Dow Theory. If you remember, this says that trends tend to continue until something happens to stop them, so absent any changes that you know about, you can expect the price to continue in the same direction, whether up or down. The price will probably use the trend-line in an up-trend as a support, as you can see above, and frequently the slope remains the same throughout the trend. So having found a trend line, a basic trading idea is to bet in the direction of the trend. This is a useful idea, not only when it is working but also when it is breaking down – you see, if the price pushes down through the trend-line, just as when it drops through support, then this is your first sign that the trend is failing and you can close your long position quickly before the price drops any further. You do not have to wait until the price drops to a previous low point to know that the trend is over. Of course, you can apply the same logic to a down-trend and to any breaking down of the trend. You may be wondering how badly a trend-line must be broken before you can say the trend is over. Again, you can take your cue from the way we look at the support and resistance levels. If the price breaks a trend for several days, or breaks it by significant amount, then it is a good sign that the trend cannot be relied upon any more. There will always be minor fluctuations, so with a good trend you may want to watch closely rather than the closing your position at the first sign of trouble. But you will usually find after you draw two or three fan lines the trend is over, and you should be looking for a down-trend to bet on. You will get used to the angle that a good trend makes – some people say that it’s about 45 degrees, but I think it’s a mistake to get hung up on that. The angle will be different depending on your chart settings, and how the time and price scales relate to each other. If you tend to look at the same chart for different securities, then you will learn to recognize what works with your settings. That’s not to say that trend-lines cannot take different angles, and they will. What you’ll notice is that if the trend-line is much steeper, which means the price is increasing more rapidly, then the trend may not keep going but run out of steam. This doesn’t always mean the trend is over, but the trend may settle back to a less steep slope when it continues. You can also have the opposite effect, when a trend starts at a lower slope and then accelerates, making a steeper line. In a sense it sometimes depends on what time scales you’re looking at – a steadily increasing price on a longer time-scale may be made up of several price “bursts” followed by retracements, and the price bursts will obviously be at a steeper slope. It can be fun to print off some charts and mark on lines with a ruler and a pencil, seeing where the price did and where it didn’t stick to these guidelines. There are a lot of different ways that lines can be put on the chart, and you need to be careful not to get confused. After the prices are plotted it is easy to see possible straight lines connecting high and/or low points, and these may have more or less significance. Some people develop an eye for plotting what are called “internal trend-lines”, which specifically join high and low points. The challenge is to find the line that joins as many points as possible. Is this exercise useful? Maybe. Such a line can indicate future support and resistance levels, but it’s much easier to see these after the event, when the support or resistance has been tested and held. My advice is not to get too complicated, unless this topic fascinates you. Just one other line that you may find it useful – it’s called the channel line or return line, and it runs parallel to the trend line on the other side of the prices. Again, by drawing this line, you are representing a support or resistance level that you expect to work. Going back to that candlestick chart we looked at for the trend-line, you can see that you can draw a parallel line on top of the prices, and this connects to several peaks. So in this case you can draw a channel line over the prices, parallel to the trend-line, and this tends to act as a resistance to the price increasing, as you can see. This will give you a good idea of where you can expect the prices to go, and if you are betting on short-term moves, you might buy when the price touches the trend-line and sell when the price touches the channel line. You tend to find that channel lines can be drawn more often when there is a stable and established trend, either up or down. It’s interesting to observe on the above chart that the price did not reach the channel line on its upward thrust just before the up-trend failed. Some traders might take this as an early warning that the trend was losing power, and in this case you can see that closing your long bet then rather than waiting for the dip below the trend-line would preserve more of the gains. You can apply just the same principles to the channel line as you do to the trend-line and support and resistance. Again, it is more established the more it has been touched and pushed back the price, the longer it has been evident, and the more recently it has been tested. With an established trend, one system of betting is to buy at the trend-line and sell at the channel line, and you may be able to do this several times before the trend fails. Just as the breaking of the trend-line signals a change in trend, in the rarer case of the channel line being broken it shows that the trend is strengthening, and can even be a reason to increase your bet on the long side. Here some basic ideas that help you figure how far you can expect the price to move. This is useful when you want to estimate whether a bet is worth taking. You always want the possible upside of a bet to be much more than the possible downside as this stacks the odds in your favour. If you stick to this guideline, which we’ll look at later, then you can see that even if you are only right half the time you will still come out ahead. First, the support and resistance, and the trend-line with its accompanying channel line can give you an idea of where the price may go to before turning back. The support and resistance are fixed levels, and the trend-line and channel line go up or down over time, but apart from this obvious difference they act in the same way. But these are not the only tools that you can use to guess the extent of any price move. Another way to put together some price targets is to look at the width between the lines, whether it is the support and resistance lines, or the trend and channel lines. One rule of thumb is that if any of these are broken, you can expect the price to go as far outside the lines as the distance between the lines. So if the price breaks up through resistance, you just look at the difference in price between the support and resistance lines, and add that onto the resistance to get a price target. You can do a similar thing to get a target in a down-trend. And because trend and channel lines work very like support and resistance, you can apply the same principle to these. The distance between them is called the “channel width” and you simply add or subtract the channel width from where the price broke out of the channel to see how far you can expect it to go. Now we’ve already said that you can generally expect a trend to continue, and the price will not go up in a straight line but a series of spurts, with retracements in-between. Wouldn’t it be great if you knew how far the price is likely to retrace? Well some people say you can. It comes out of observing the way prices move in a retracement, and technical analysts found that they tend to go back a percentage of the previous move, either 33%, 50%, or sometimes as much as 67%. You should note that this is a percentage of the immediately previous advance, not a percentage of the total price. So if you want to bet on the long side on a stock in an up-trend, you could wait until there is a retracement and expect to at least get one third off the previous move. You will find that this guideline applies regardless of the time scale that you are trading, as it relates to all sizes of trend. Sometimes you will see it quoted as 38.2%, 50% and 61.8% for reasons we’ll go into later. For practical purposes there’s not much difference. The most interesting retracement is 67%, or two thirds. This is important for a couple of reasons. If the price happens to drop back this far, then there are two particular points – if it continues down, it is likely that the trend is finished; but if the trend is strong, it will give you the maximum profit if you buy at this point. Note that this is not a good enough reason to wait for a 67% retracement, as you will see the price often dropping only to the lesser values and should be betting on them, when appropriate! Now you are developing an idea of where you can expect a price chart to go, and this will help you in picking the best bets in your trading. There are many other concepts to technical analysis which we will go into in subsequent sections, but you should have this section in mind whenever you look at charts, and be looking for trends and support and resistance levels, which will complement the future concepts. You can play around drawing lines on charts, and discover lots of interesting intersections. Make sure you don’t forget the simple concepts when you get involved in the more technical stuff to come. Trading with trend lines as a guide is not rocket science and is more akin to basic geometry. It does not take a genius to draw a line on a chart. Momentum indicators require a few more brain cells but any 10 year old can be taught to recognise a divergence of momentum indicator and price. Also some traders and spread betters get all in a tizzy every time a piece of economic data is released. I do not understand why that is, a technical trading system should ignore any fundamentals that suddenly comes across the screen. I am oblivious to all but the most trumped up of economic releases. As you can probably guess my philosophy to spread betting is to keep it as simple as possible, embarrassingly so. Some would call it plain ignorance. For me however financial spread betting is emotional enough without the hassle of information overload. My approach to trading is very simple but for me that is what suits my personality. Finding a style that matches your personality is one of the keys to profitable trading but so is keeping the system simple enough that it becomes second nature.